It adopts plate-type chain transmission and adjustable even material-feeding, which can satisfy different requirements and be used in more areas. Big block and high density materials can be transported. It also can convey a long distance in high production efficiency. Drive system and support device are designed inside of sealing chamber with strong dust-proofing ability. 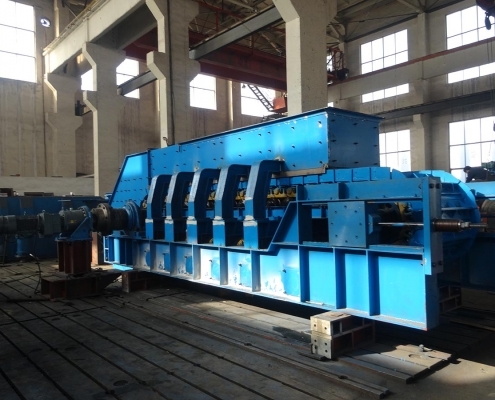 The equipment has following features such as reasonable structure, stable operation, lower failure rate, long service life and easy maintenance. The BG series of plate conveyor is the equipment that chain wheel drives scraping belt move to convey big block, cold, hot block materials. The equipment can bear heavy stock column pressure and impulse load with the feature of stable operation, even material-feeding and easy maintenance. It has been widely used in mine, metallurgy and ceramic industry. These series are newly developed and designed by our company which is based on the similar equipments from abroad company. We make many improvements on the new type equipment. The equipment is usually supplied as conveying cold materials. Please specify in the contract if users are transporting hot materials.